Hey guys, Reik here again with another article about the math behind Warmachine. 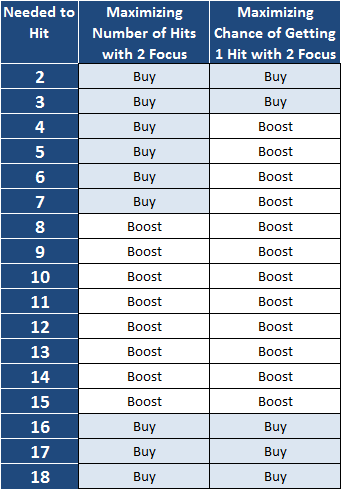 The focus on this article will be about boosting. We’ll start with when it’s optimal to boost damage rolls then go over when it’s optimal to boost attack rolls. In addition we’ll talk about a couple special cases when boosting isn’t just about getting the most expected damage or hits possible. Also as a bonus I created a neat little damage simulator that shows the distribution of damage done based on inputs you set. It’s an Excel Workbook that requires Macros so I don’t know if it works in Google Drive. A link to the workbook can be found at the end of the article. Many of us have heard the rule of thumb “At Dice – 4 boost, at Dice – 3 Buy,” which is unfortunately not always good advice. The first part is correct in the sense that any time you’re at dice – 4 or higher boosting results in the highest Expected Value. Unfortunately, the second part of this rule only applies in cases in which you automatically hit your target. This is because it does not account for the fact that you only boost after knowing that you’ve hit the target. 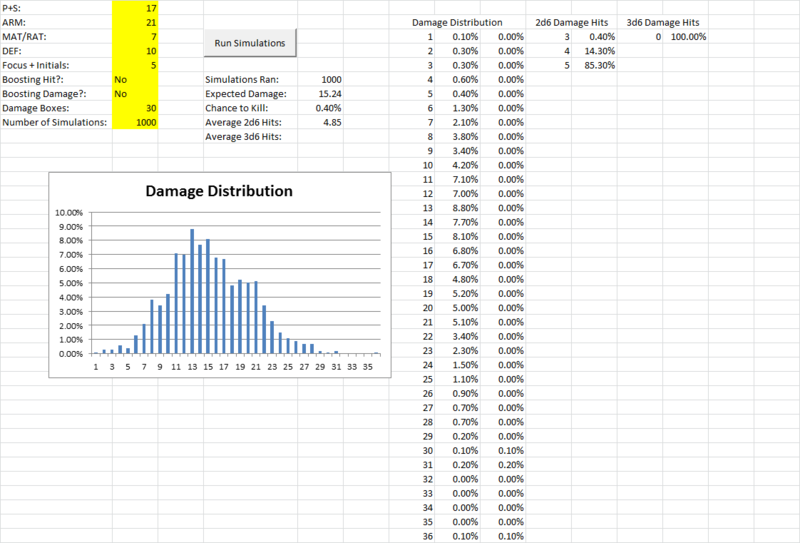 Because you only boost after knowing you’ve hit, the 3.5 Expected Damage you get from adding a dice is not affected by your hit chance, where as when you buy an attack the 2d6 +/- X damage you get from hitting your target is affected by your hit chance. This means there are many situations in which you could be at dice – 3, dice – 2, or even dice + 1 and still boost damage. Below is a table which shows the Expected Value of attacks at different dice-off-armor values and different to-hit values. The fields highlighted in blue indicate an Expected Value of less than 3.5. In these cases you maximize your Expected Value by boosting damage. This table assumes you’re not boosting your hit roll in addition to boosting your damage roll. In this situation since each attack is worth 2 focus you would boost any time the expected value of your attack is less than 7 which you can calculate by taking your boosted hit chance and applying it to the expected value of your damage roll. When boosting attack rolls there are 2 major outcomes that that come to mind. The first outcome is wanting to maximize the number of hits you land. This is used mostly when you’re trying to kill a heavy with another heavy. The calculations for this are pretty simple. In cases where boosting doubles your chance to hit, you’ll increase your expected value. In situations where boosting doesn’t double your chance to hit, you won’t. The other outcome is trying to make sure you get at least 1 hit with your remaining focus. Say you’ve got a Battle’d Templar who has managed to Beat Back his way to a zero camp pNemo and you’ve hit him once bringing him down to 7. If you just land one more attack at P+S 19 he’s auto-dead and you have 2 focus left. This case is pretty extreme as the final hit will auto-kill our target, but it demonstrates the math well. In this situation we’re not trying to maximize the number of attacks we land, we’re trying to maximize the chance that we hit him at least once since it only takes 1 hit to kill him. The easiest method used to calculate this is to find the probability that we don’t get a single hit and take 1 minus that. This method uses the Law of Total Probability because we’ve got two events, at least 1 hit or 0 hits, and one of them has to occur, therefore their probabilities are just 1 minus the other. The graphics below illustrates when boosting to-hit is optimal depending on which outcome is desired. The larger chart shows the numbers breakdown for the two situations with the cells shaded in blue representing the optimal choice. The second graphic is a simplified version used as an easy reference. 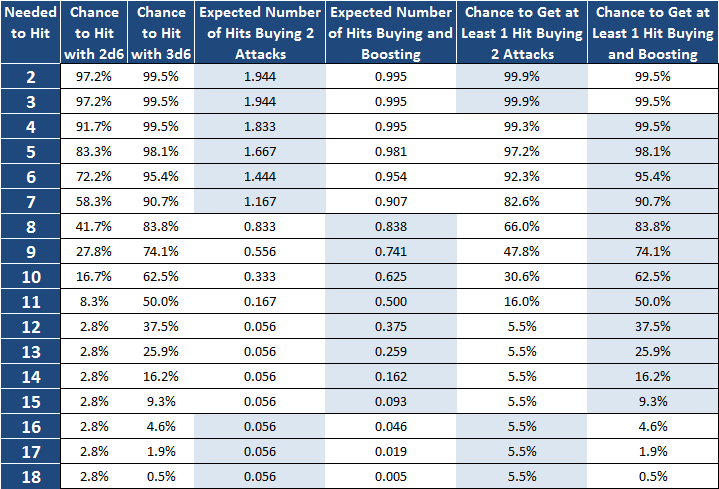 In cases when you need higher than a 12 to hit on 2d6 the chance to hit is based on boxcars always hitting. It’s pretty interesting that once you get up to a 16 to hit it’s better to hope for boxcars as opposed to boosting. Some times in Warmachine you find yourself in unfortunate situations where the only real chance of victory you have comes at unlikely odds. While we don’t want to put ourselves in these positions, we still want to make the best decisions when in these situations. With regards to boosting, a lot of times this means not boosting even though mathematically you should, and hoping you roll high. The reason this works out is that the more dice you add the more “centered” the distribution gets and the more consistent your rolls get. When trying for the extremes, consistency is not your friend. I had a big spiel put together about how this can be proven analytically by a term called “Kurtosis” which measures the tail weight of our distributions. Unfortunately the theory doesn’t apply because of the fact that if you need a 6 to hit rolling a 7 and 9 are functionally the same since a 9 doesn’t hit “better” than 7. Because of this we’re just going to have to do some simulations to “prove” this theory numerically which ended up being more fun anyways. It lets you put in a series of parameters, chose if you want to boost Attack and/or Damage rolls, then simulates the outcome repeatedly and creates a distribution accordingly. Using the same parameters and changing whether or not you want to boost can let you know which situation has a higher expected value or a higher chance to kill. Running the parameters shown in the screenshot both ways yielded the following results @ 1000 simulations: Not Boosting — 15.24 Expected Damage, 0.4% Chance to Kill, Boosting Damage — 15.76 Expected Damage, 0.1% chance to kill. This illustrates that while boosting yields a higher expected damage, it has a less chance to kill, making it sub-optimal when the only thing that matters is whether or not your target dies. Robert received his Undergraduate degree in Mathematics with a focus on Statistics and a Minor in Actuarial Science. During the day he works as an actuary for a major insurance carrier, and in his free time he eschews painting his miniatures to create spreadsheets based on the six-sided die or spend time with his wife and cats. He plans on playing his paintless CoC army as soon as enough of the faction is released.